1688: Kichizaemon plays in Kyôto at Miyako Mandayû's theater the role of Senma in the drama "Ôkumagawa Genzaemon". 1689: Kichizaemon plays in Kyôto in the drama "Waka no Ura Katao Nami". 3rd lunar month of 1693: the first drama written by the playwright Chikamatsu Monzaemon for the star Sakata Tôjûrô I is performed in Kyôtô at Miyako Mandayû's theater. The play's title is "Butsumo Mayasan Kaichô" and the others actors in the casting are Yamashita Hanzaemon I, Yoshizawa Ayame, Kirinami Senju I, Iwai Heijirô and Kichizaemon. 1695: Kichizaemon's rank in the Kyôto hyôbanki, dôkegata section, is jô (superior). 7th lunar month of 1698: Kichizaemon plays in Kyôtô at Miyako Mandayû's theater the role of Tokuzô in Chikamatsu Monzaemon's drama "Isshin Niga Byakudô". 1st lunar month of 1699: Kichizaemon's rank in the Kyôtô hyôbanki, dôkegata section, is jô-jô-kichi (superior - superior - excellent). 1st lunar month of 1701: Kichizaemon plays in Kyôto at Miyako Mandayû's theater in the dramas "Onzoshi Hatsutora Mairi" and "Keisei Fuji Miru Sato" which are produced by Kokon Shinzaemon. 11th lunar month of 1701: Kichizaemon plays in Kyôto at Miyako Mandayû's theater the role of Gorakubô in the drama "Shin Komachi Eiga no Kuruma", which is produced by Arashi San'emon II. 1st lunar month of 1702: premiere in Kyôto at Miyako Mandayû's theater of Chikamatsu Monzaemon's drama "Keisei Mibu Dainenbutsu", which is produced by Kokon Shinzaemon; Kichizaemon plays the role of the ahô Chôbê. 11th lunar month of 1704: Kichizaemon plays at Miyako Mandayû's theater the role of Ahô Manroku in Chikamatsu Monzaemon's kaomise drama "Kisshô Tennyo Anzan no Tama". 1st lunar month of 1712: Kichizaemon plays in Kyôto at Ebisuya Shôdayû's theater the role of Saizô in the drama "Onna Wankyû", which is produced by Yoshizawa Ayame I. Fall 1712: Kichizaemon goes to Ôsaka. 11th lunar month of 1712: Kichizaemon becomes tachiyaku and plays the role of Asakura Kin'emon in the kaomise drama "Mikawa no Kuni Yatsuhashi no Kura Saiwai Chôja", which is produced by Arashi Sanjûrô I at Shioya Kuroemon's theater. 1st lunar month of 1713: Kichizaemon's rank in the Ôsaka hyôbanki, tachiyaku section, is jô (superior). 11th lunar month of 1713: Kichizaemon plays the role of Rokurô Saemon in the kaomise drama "Yoyo Meoto Tsuru no Mago", which is produced by Arashi Sanjûrô I at Shioya Kuroemon's theater. 1st lunar month of 1714: Kichizaemon's rank in the Ôsaka hyôbanki, tachiyaku section, is jô-jô-(shiro)kichi (superior - superior - (white) excellent). 11th lunar month of 1714: Kichizaemon plays in Ôsaka the role of Mikazuki Tairanosuke in the kaomise drama "Daikoku Shinmai Dawara", which is produced by Anegawa Shinshirô I. 11th lunar month of 1716: Kichizaemon plays at the Ônishi no Shibai the role of Kinsuke in the kaomise drama "Kogane no Ichigura", which is produced by Sawamura Sôjûrô. 1st lunar month of 1717: Kichizaemon's rank in the Ôsaka hyôbanki, tachiyaku section, is jô-jô-kichi (superior - superior - excellent). 11th lunar month of 1717: Kichizaemon plays at the Naka no Shibai the role of Kinbê in the kaomise drama "Inari Yashiki Daikoku Bashira", which is produced by Sawamura Chôjûrô I. 12th lunar month of 1717: Kichizaemon plays in the same theater the role of Yohê in the kiri kyôgen "Ôsaka Shinjû Hajimari" . 1st lunar month of 1718: Kichizaemon's rank in the Ôsaka hyôbanki, tachiyaku section, is back to jô-jô-(shiro)kichi (superior - superior - (white) excellent). Fall 1718: Kichizaemon goes back to Kyôto after 6 seasons spent in Ôsaka. 11th lunar month of 1718: Kichizaemon plays at Miyako Mandayû's theater in Sadoshima Saburôzaemon's kaomise drama "Meoto Matsu Jufuku no Kodane". His stage partners are Otowa Jirosaburô I, Mihogi Gizaemon I, Bandô Hikosaburô I, Hyakuninshu Genzaburô, Miyazaki Giheita, Yamamoto Kamon, Tamagawa Genzaburô and Yamashita Kamenojô I. 1st lunar month of 1719: Kichizaemon's rank in the Kyôto hyôbanki, tachiyaku section, is jô-jô-(shiro)kichi (superior - superior - (white) excellent). Fall 1719: Kichizaemon goes to Ôsaka. 11th lunar month of 1719: Kichizaemon becomes zamoto and produces at the Ônishi no Shibai the kaomise drama "Kogane no Mitsu Gashiwa". 1st lunar month of 1720: Kichizaemon's rank in the Ôsaka hyôbanki, tachiyaku section, is jô-jô-kichi (superior - superior - excellent). 11th lunar month of 1720: Kichizaemon moves to the Kado no Shibai and plays in the kaomise drama "Hana Yakata Chibikizuru", which is produced by Kirinoya Gonjûrô I. 1st lunar month of 1721: Kichizaemon's rank in the Ôsaka hyôbanki, tachiyaku section, is back to jô-jô-(hanshiro)kichi (superior - superior - almost excellent). 11th lunar month of 1725: Kichizaemon writes and plays in the kaomise drama "Wagô no Futabashira", which is produced by Arashi San'emon III at the Kado no Shibai. 1st lunar month of 1728: Kichizaemon writes and plays in the drama "Atomeron Keizu no Hakozaki", which is produced by Arashi Sanjûrô I at the Kado no Shibai. 11th day of the 9th lunar month of 1728: Kichizaemon dies in Ôsaka. Kaneko Kichizaemon was an outstanding dôkegata actor in Kamigata from the Genroku period to the Kyôhô era, excelling in fool (ahô) roles. He decided to switch to tachiyaku roles from the 11th lunar month of 1712. 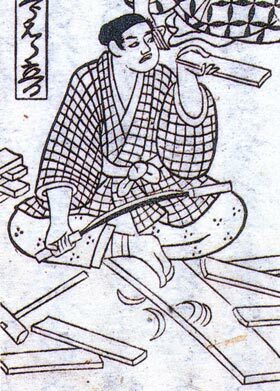 He was also an important playwright, who was, along with Tominaga Heibei, a disciple of Kaneko Rokuemon and collaborated with Chikamatsu Monzaemon. When Chikamatsu Monzaemon left the Kabuki world to write for the puppet theater, Kaneko Kichizaemon became the favourite playwright of the star Sakata Tôjûrô I. "Kichizaemon worshipped the great actor for whom he wrote, and put down his sayings about the theatre and his art as though they were oracles". Kaneko Kichizaemon wrote two books, called "Nijinshû", (literally "Collection of the Ears Dust"), a collection of actors stories, mainly Sakata Tôjûrô I's words and pieces of advice on his art. It is worthy of note that Kichizaemon "was criticised adversely because he made his own part prominent in the plays he wrote"
The 2 sentences within double quotes are from Zoë Kincaid in "Kabuki, the Popular Stage of Japan".